'Why tessellation?' you may well be asking. Let me explain. So often in the classroom we try to make activities more enjoyable for the children by varying our teaching to include a more tactile or "hands on" approach. For many, this is their preferred method of learning and, in general, it engages pupils more effectively. There is so much scope for practical exploration of tessellations both in and out of the classroom. It seems a golden opportunity to link art with maths, allowing the creative side of your children to take over. And of course, there is so much maths involved! Tessellation is a system of shapes which are fitted together to cover a plane, without any gaps or overlapping. The word tessellation itself derives from the Greek tessera, which is associated with four, square and tile. Presumably this is an indication of the fact that tiles of this shape are the easiest to interlock. Tessellations are a common feature of decorative art and occur in the natural world all around us. Two people have principally been responsible for investigating and developing tessellations: Roger Penrose, an eminent mathematician, and the artist, M.C.Escher. Roger Penrose took these a step further. While studying for his PhD at Cambridge, Penrose became fascinated by the geometry of covering a plane. He began by investigating combinations of shapes which would produce a repeating unit, but this led on to a search for a pattern with no repetition. This kind of tessellation became known as quasi-periodic, in other words at first glance there appears to be a repeating pattern, but in fact there is not. Although there are small repeated sections, there is no single unit which can be copied to fill the plane. This in itself makes a lovely investigation for children. Another remarkable man who contributed enormously to the study of tessellation was the Dutch artist M.C.Escher. Born in 1898, initially he concentrated on sketching scenery and surrounding objects. However, on a visit to Alhambra in Spain, he became fascinated by the Arabic tessellating patterns contained in the tiles, and started to experiment more with shapes and mirror images. This tessellation consists of interlocking rectangles which contain the fish and boat images. The rectangles are translated diagonally to produce the entire image. 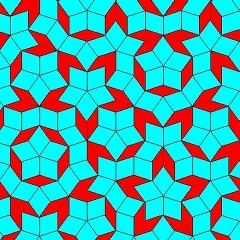 This is one of the simplest types of tessellation. This second tessellation is much more complicated. It contains interlocking rhombi which have undergone several transformations including translations, rotations and reflection. All M.C. Escher works (c) 2001 Cordon Art - Baarn - Holland. All rights reserved. Used by permission. Escher gained a great deal of respect from mathematicians for his work and lectured on art, maths and science. It is interesting to note that Escher was inspired by the Alhambra Palace in Spain, one of the finest examples of Islamic architecture. Due to the fact that Islamic people were forbidden to represent humans and living creatures in any decorative form, they became masters of tiling patterns and tessellations. Closer to home, the Great Court of the British Museum in London is another magnificent example of architectural tessellation. Or is it? Its incredible roof is entirely made up of triangular shaped panes of glass supported by a steel framework. However, although the panes have been fitted together without overlapping or gaps, this is not a true tessellation. In order to create the curved 3-dimensional roof, the pieces of glass cannot be identical. Perhaps we could call this a 3-D tessellation? Tessellations lend themselves very well to exploration with children. Look around your classroom and school for examples. When a surface is covered tessellating designs are often used. Go out into the playground and perhaps lead into discussion of natural and unnatural tessellations. Our "3-D tessellations" can frequently be found in nature. What about scales on a fish or a tortoise shell? A pineapple's "skin", ears of corn and honeycomb could all be classed as tessellations in 3 dimensions. Challenge the children to find more examples. Back in the classroom, you can further their understanding of tessellation and develop the mathematical ideas. Using plastic shapes which can be clicked together, allows children to construct the tessellations themselves and this can be easily extended into a 3-D investigation.